If you are not a member of the B&B Owners Association, you can still benefit from our Internet presence with our "Pay for Clicks" programme. Display your B&B in our portals, directories and regional websites in Ireland and the "Pay for Clicks" programme will redirect guests directly to your existing website or booking service. We take NO COMMISSION and this approach may suit the online marketing of your property better than full or associate membership . This is particularly true if you already use a channel manager to spread your B&B's online presence over many 'OTAs' or booking services. GOOD VALUE? 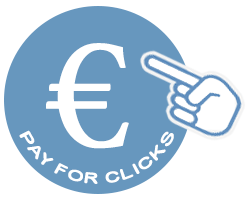 You can monitor your "Click Throughs" and see the extra visitors we send to your website in your B&B's dashboard (www.my-bnb.com) - typically we'd expect between 1,000 & 2,500 "click throughs" per year - at best that's around €0.08 per click. Compare this with search engine Ads for the Travel & Hospitality sector that cost €1.35 per click or more - Over SIXTEEN times as much.